Installing this 3-5/8" big bore kit will increase the displacement of stock 80" HD® shovelhead engines to 88" using the stock 4-1/4" flywheels. This may also be used to build an 88" engine in 74" shovelheads if a 4-1/4" stroke flywheel assemble is also installed. 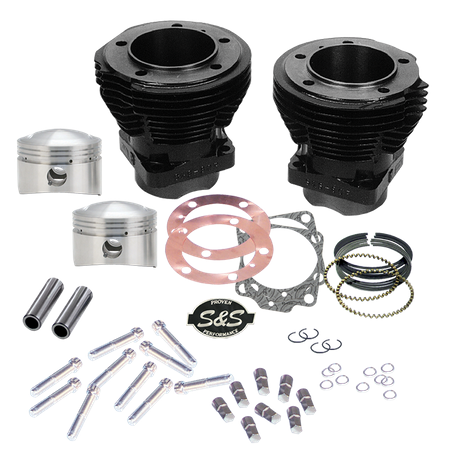 The kit includes S&S 3-5/8" bore cylinders, 3-5/8" bore forged pistons with rings and wristpins, S&S stainless steel head bolts, base nuts, head gaskets, base gaskets, exhcaust gaskets, and instructions. Compression is 7.5:1. The cylinders are stock length so stock length pushrods and manifold may be used.